But what “peace” means is a question that lingers after combatants put down their arms. This is a point that many thinkers have made (in a recent essay I referred to the positive v. negative peace and direct v. structural violence concepts of Martin Luther King, Jr. and John Galtung). 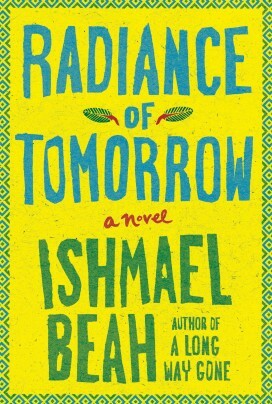 And it is a point that Ishmael Beah makes, beautifully, in his just-published novel, Radiance of Tomorrow. Long after the fighting has ended, these youths and other persons of all ages return to the village of Imperi – a name that shares roots with “empire” – in “Lion Mountain,” the anglicized name for Sierra Leone. Together they try to rebuild. But a new force invades even as they endeavor to retie the bonds of what had been a traditional, agrarian society. It is the outside world, capitalism in the forming of a mining company. It extracts valuable minerals first from the surrounding area and eventually from the town itself. Schools and story-telling lose support as the town center fills with bars and brothels. The resting place of ancestors is dug up even as new casualties of hazardous work are buried. The technique works exceptionally well in the novel’s first part, which is rich in imagery: “the dark spots where fire had licked with its red tongue,” for example, and “the day that war came into her life.” It seems to wane as the novel unfolds, however. This erosion of prose-poetry may be intended to mimic the depletion of Imperi and its people. The prosaic replacement may reflect the people’s new and different life – as Beah puts it in passages with which the novel begins and ends, their new story. Beah thus provides a thought-provoking answer to the post-conflict question of the meaning of peace.